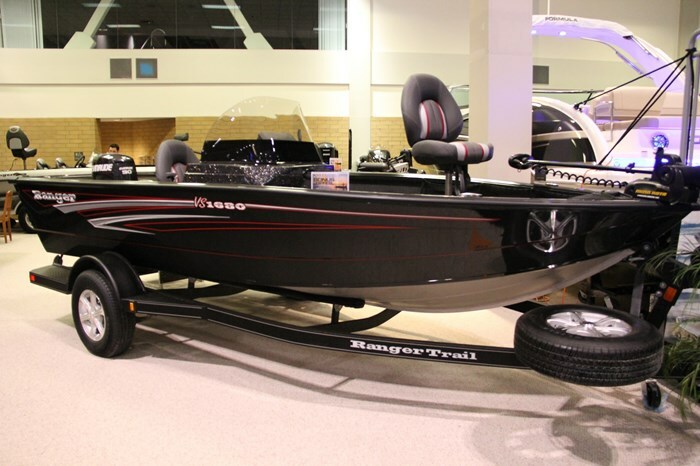 The Ranger VS1680 is all-new for 2015 and in Ranger’s words, “Is ideally-sized for bigger waters and smaller tow vehicles.” It is one of two models in Ranger’s Deep-V series of all-welded aluminum multi-species fishing machines – the other being its bigger sister VS1780. They form part of the eleven models in three series of Ranger aluminum boats. 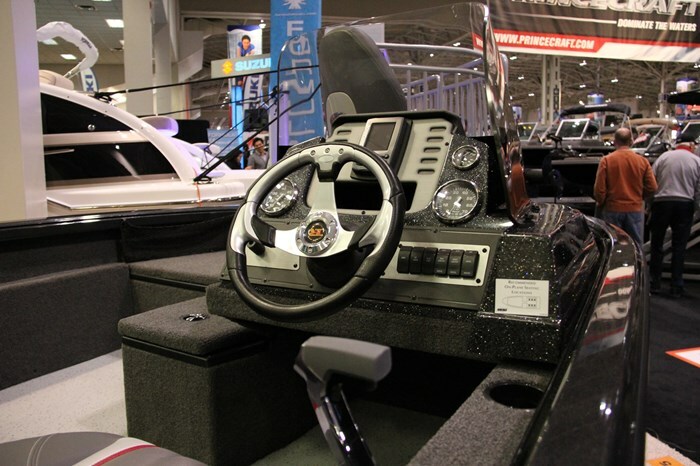 This Flippin, Arkansas builder also offers thirty-three models in nine series of fibreglass fishing-serious boats from sixteen to twenty-five feet. The standard model VS1680 is a side console design but may be optionally outfitted as a dual console, each with its tall, almost U-shaped molded plexi windscreen, or, utilizing the same fibreglass molded consoles, outfitted with a full three-piece, rounded corner walk-thru windshield to which optional canvas, including a stand-up top and curtains may be added for weather protection. This latter set-up is ideal for our Canadian prime fishing seasons and conditions. Specifications, standard and available optional equipment is identical for all three set-ups, except of course weight. The all-welded, 100% wood-free aluminum hull, floors, and deck of the Ranger VS1680 is foam-filled one-piece construction offering upright and level flotation. The aluminum transom is reinforced with pultruded fibreglass for increased compression strength. Gunnels are equipped with Ranger’s Lock-Track™ extruded rail system for handy attachment of various optional fishing accessories. The gunnel surfaces are designed to be protrusion and snag-free even utilizing standard pull-up cleats. 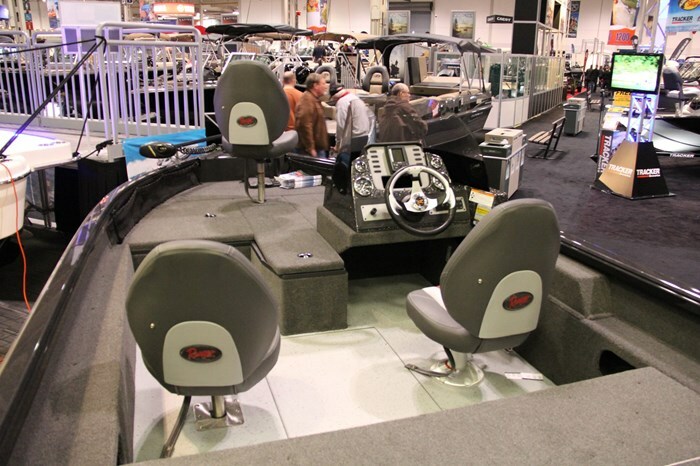 Three custom built Ranger® contoured swivel fishing seats designed for enhanced lateral and leg support are provided with four cockpit floor mounting bases plus one base each in the bow and stern decks to accommodate these seats. The driver’s seat is equipped with an adjustable slider. Standard cockpit flooring is treated with Ranger’s Rawhide™ coating with carpet covering the bow and stern decks and interior walls. Snap-in cockpit carpet is optional. The stern deck features a dedicated battery storage compartment on the starboard side and a timed, aerated and divided livewell on the port side. An optional extendable stern deck flip-down bench complete with a pair of folding jump seats with a centre storage console with built-in drinkholders is available to provide additional family-type seating to accommodate the maximum on-board capacity rating of five persons. A two-step folding starboard side transom boarding ladder is standard. Centred within the bow deck is a dedicated and lockable rod storage locker with eight tapered rod tubes with fully closed ends to prevent snagging and designed to accommodate rods up to eight feet long. On each side of the bow deck is a large longitudinal gear storage compartment complete with raised gasketed lips surrounding the openings to deter water ingress. The molded bow trolling motor platform comes complete with a standard Minn Kota® 45PD, 48” trolling motor. Centred within the bow deck is a dedicated and lockable rod storage locker with eight tapered rod tubes with fully closed ends to prevent snagging and designed to accommodate rods up to eight feet long. On each side of the bow deck is a large longitudinal gear storage compartment complete with raised gasketed lips surrounding the openings to deter water ingress. The molded bow trolling motor platform comes complete with a standard Minn Kota® 45PD, 48” trolling motor. 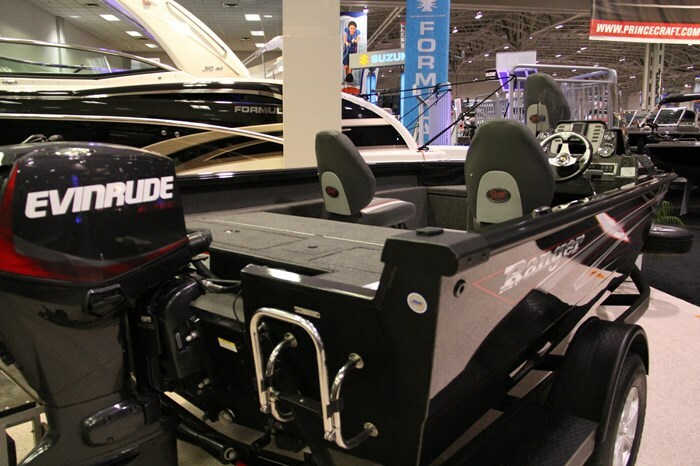 Your choice of Evinrude, Mercury, Suzuki, or Yamaha pre-rigged outboard power from 60 to the rated maximum 90 horsepower is available. Ranger is suggesting top speed with a fully rigged and fueled VS1680 with 60 horsepower is in the range of 34 to 38 mph and with the 90 horsepower, 36 to 40 mph. There are four choices of baked urethane paint colours complete with custom Ranger hull graphics; White, Silver Metallic, Charcoal Metallic, or Crystal Red Metallic. Notable additional standard equipment includes a custom Ranger Trail® single axle SM29 trailer with a tongue swing jack and Swing Away tongue, a Dual Pro 6x1 battery charger, and oversized tackle organizer storage boxes. Additional optionally available equipment includes several two and three-bank battery chargers, nine choices of Humminbird® or Lowrance® bow-mounted sonar/fishfinder/GPS electronics, six choices of upgraded Lowrance® in-dash electronics, cargo netting for the bow deck sides, seating upgrades and additions, an upgraded recirculating livewell, fourteen choices of trolling motor upgrades, Lock-Track™ accessories, plus additional trailer accessories.